M ary Ann Fitzpatrick, 88, formerly of Oak Court and Parknoll Lane, Port Washington, Wisconsin died at her Ellen’s Home residence in Port Washington on February 19, 2014. She was born September 13, 1925 in Oshkosh, Wisconsin to Sherman Wilfred and Mary Schano Peterson. She married Harold Fitzpatrick on November 7, 1942 in Oshkosh, Wisconsin. In 1958 they moved to Grafton, Wisconsin and then in 1966 settled in Port Washington, Wisconsin. She worked as a dietary supervisor at Heritage Nursing Home for 20 years, retiring in 1992. Her husband Harold preceded her in death January 15, 1997. Mary Ann was a member of Friedens Evangelical Church. 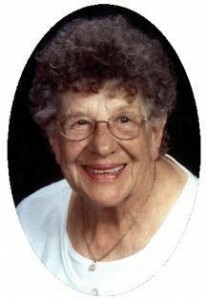 She was an avid reader, loved to knit and crochet, enjoyed playing cards and adored her grandchildren. When she moved to Ellen’s Home in 2012 she really liked the friendships, sociability and activities. She is survived by her children Sherry (Ed) Buchholtz of Grafton, Jim Fitzpatrick of Port Washington, Katie (Howard) Emory of Saukville and Karen Brey of Saukville. Further survived by grandchildren Kristin (Christopher) Kish of Brookfield, Sara (Dave) Demge of Port Washington, Kyle Buchholtz of Grafton, Erin Fitzpatrick of Port Washington and Matt Brey of Milwaukee, great grandchildren Ryan Demge, Oliver Kish and Chloe Kish, sisters-in-law Arlene Peterson of Florida, Colleen Furman of Oshkosh and Patsy Gilbert of Oskosh, nieces, nephews other relatives and friends. She is preceded in death by her husband Harold, brother Lester (the late Joyce) Peterson and Kenneth Peterson and canine pal Sadie. Pastor David Toeller will officiate funeral services 6 pm Monday, February 24, 2014 at Friedens evangelical Church, 454 N Milwaukee Street, Port Washington. Visitation 4 pm to 6 pm Monday AT CHRUCH. Memorials to Friedens Church or the Ozaukee Humane Society Appreciated.